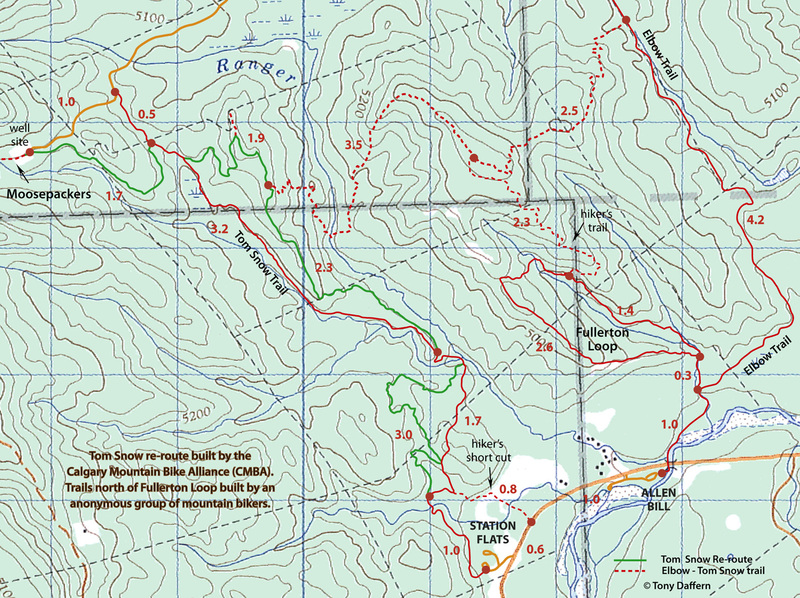 The Calgary Mountain Bike Alliance (CMBA) has completed the four-section re-route of Tom Snow Trail. The first two sections, constructed by hand, avoid some of the worst sections of Tom Snow. They are narrow and winding and not really suitable for equestrians. Hikers aiming for the more scenic northern section of the trail can shortcut up the cutline from the end of the first re-route to gain Tom Snow half-way down the big hill. The last two sections of the re-route were built by machine with some hand finishing and are wider and less winding. They are among the best sections of trail that have been built recently in K Country in terms of routing and construction. The third section climbs onto the timbered ridge between Ranger Creek and Tom Snow. There is one good viewpoint about a third of the way up. Just before the end of the ridge, the trail descends to Tom Snow. The fourth re-route heads off round the end of a ridge to the Line Block Valve at the end of Shell’s resource road and joins Moosepackers. Great job CMBA! Over the past couple of years another group of mountain bikers has built a trail across the high ground north of Fullerton Loop (name needed) that joins Elbow Trail to the ridge on the third re-route (we need a name for this hill too!). They also built a section that leads down to Fullerton Loop; while Fullerton is closed (officially) to bikers, it makes a good connector for hikers. These new trails offer users many new loops of varying length and difficulty. Click on the map below to download an 11″ x 8.5″ version. I know all of the guys who built the trail and know they’re working with the Greater Bragg Creek Trail Assn (CMBA has been involved with consulting on the trail design). I think it’s fantastic and am really looking forward to getting everything connected up. My concern is that the current trails as they are are not sustainable and by sending people/riders down them you are causing unnecessary damage and potentially bad rider/hiker interactions since the trails are designed for bikes to carry quite a bit of speed and many of the turns are blind. thanks for giving the reason behind the name–who would have guessed? and the update on work still needing to be done. 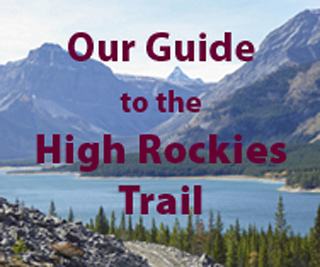 All the trails you mention except for Sugar Momma have been incorporated into the Greater Bragg Creek Trails Assn. trail plan with some adjustments to be made. This doesn’t mean hikers can’t walk the unofficial, so-called “illegal” “rogue” trail. And as far as I know it is still being ridden. It makes sense to me to have a bike trail connecting the south end of Elbow trail to the Ranger Hill hub of trails. See volume 2 of the KC Trail Guide. Interestingly, the guys that built these “illegal” trails are now working for the Great West Bragg Trails Assn. Just a comment on those trails that come off Ridgeback and connect to Ranger Ridge/Fullerton Loop. They do already have names (House of Pain, Sugar Momma, Strange Brew), but I should point out that they are illegal trails, not permitted, not built to sustainable specifications – actually only a system of raked “trails” defined mostly be downed trees. Use of those trails should be discouraged. However, that being said, some aspects of these trails have been built into the Greater Bragg Creek trail plan and a similar route WILL be built that is LEGAL and SUSTAINABLE. Thanks for the kind comments on Ridgeback (I’ve been heavily involved myself, my husband led the machine-crew, and it’s named after my Rhodesian Ridgebacks who played along the ridge-top during the building process). We realize there are some wet spots on the trail and are still working on tweaking some areas of poor drainage so please be patient. Watch for a reroute on the second section to lift the trail to a better drainage point and armouring of small sections further up.